To Cite: Faridaalaee G, Mohammadi N, Mehryar H, Tabatabaee S J, Hosseini P, et al. Botulism Poisoning With Home Canned Cheese, Arch Clin Infect Dis. 2013 ; 8(4):e16451. doi: 10.5812/archcid.16451. Introduction: Botulism is an acute form of poisoning resulted from ingestion of Clostridium botulinum toxin. Case Presentation: Here we present five cases of food-borne botulism poisoning from home produced cheese. Five patients from one family referred to our emergency unit with complaints of weakness and two had severe symptoms. In spite of the laboratory negative results antitoxin was administered and their symptoms improved. Discussion: Botulism poisoning can develop with any home-canned food and people must avoid consumption of such products. Botulism is an acute form of poisoning that results from ingestion of a toxin produced by Clostridium botulinum. Botulism toxin causes major effects by blocking neuromuscular transmission in autonomic and motor nerve terminals (1). C. botulinum produces neurotoxins and there are seven type of C. botulinum toxins (A- G) (2). There are five forms of botulism: food-borne botulism, infant botulism, wound botulism, unclassified botulism and inadvertent botulism (3). C. botulinum grows and elaborates toxins only when the food presents conditions that include an anaerobic milieu, a pH of 5.6, low salt and sugar content, and a temperature of 4-121˚C (4). Ingestion of the produced toxin causes food-borne botulism. Home-canned foods are the major cause of intoxication in the United States (5). The signs and symptoms of food-borne botulism initiate 18-36 hours after the ingestion of toxin-containing foods (6). First cranial nerves become involved such as diplopia, blurred vision, dysphasia, dysarthria, dysphonia, vertigo, appear, and then symmetrical descending muscle weaknesses develop (6). Anticholinergic toxidrom such as dry mouth, ptosis, and fixed dilated pupil may be seen. The gag reflex decreases or becomes absent (3). Patients are usually alert and afebrile (6). The diagnosis of botulism is clinical (6). The diagnosis is confirmed by detection of toxins or spores of C. botulinum in the probable food, stool, gastric content or blood (6). Guillain Barre syndrome, myasthenia graves, Lambert Eaton myasthenic syndrome, acute poliomyelitis and diphtheria must be considered in the differential diagnosis. Electro-diagnostic studies have been shown to be of value in differentiating botulism from other paralytic diseases (1). Here, we present five cases of food-borne botulism poisoning from an unusual and special type of home Produced cheese, named “kupeh” cheese. 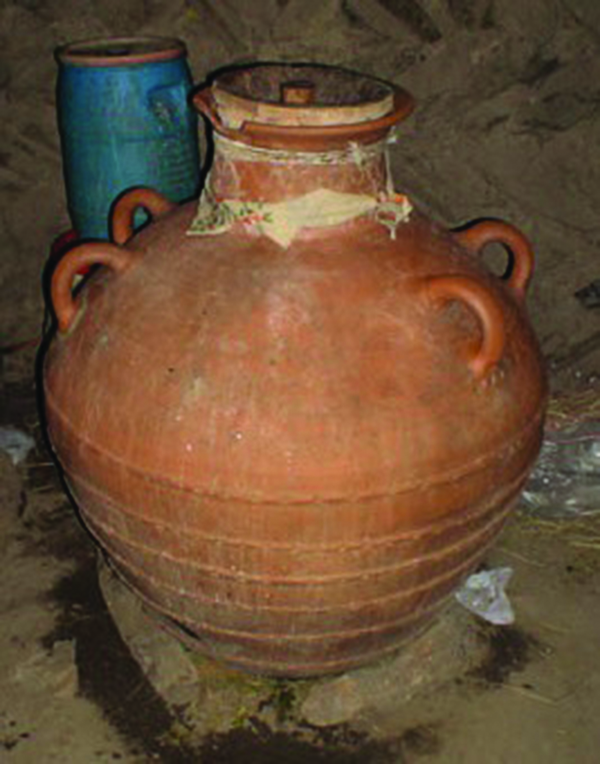 The “kupeh” cheese is produced by nomads using a traditional method. They only warm milk up to 50˚C, without pasteurizing and without adding salt. They grind this cheese and decant in an earthenware jar and store with the lid on (Figures 1 and 2). During early August, Five patients from one family were admitted to our emergency unit with chief compliant of weakness. 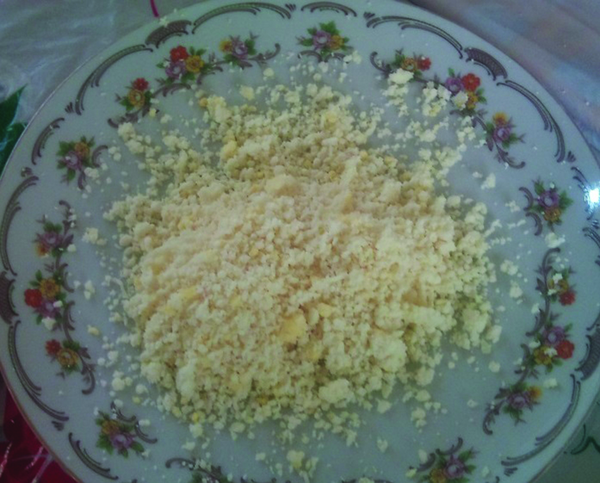 They had eaten a special type of home produced cheese (“kupeh” cheese). Three Patients had mild symptoms and the other two patients had severe symptoms. Case 1 was an 11-year-old girl and case 2 was her brother a 12-year-old boy. They had weaknesses, which had begun on the previous day and was prominent in neck muscles. These two patients had similar signs and symptoms including dysphagia, aphonia, ptosis and shallow breathing. The gag reflex was absent. They were alert. They were admitted to the emergency care unit (ICU). Electromyogram (EMG), nerve conduction velocity (NCV) and lab tests were performed to rule out differential diagnoses, such as Guillain Barre syndrome, myasthenia graves, Lambert Eaton myasthenic syndrome, and acute poliomyelitis, were normal. We sent specimens of the cheese, stool, and gastric content to find C. botulinum spores and toxins. The laboratory didn’t find C. botulinum spores and toxins and reported negative results. The ICU neurologist administered antitoxin for the patients in spite of the negative lab results. After 27 days patients’ symptoms became normal and the patients were discharged. Case 3, 4 and 5 were other members of the family: a 17-year-old and a 22-year-old girl, and a 42-year-old man. They only had weakness and vertigo. They were admitted to the neurology ward and began taking antitoxins. EMG, NCV and lab tests were normal. After 5 days, patients’ symptoms became normal and the patients were discharged. Botulism is a rare paralytic disease (2). In this report, we present five cases of botulism poisoning associated with a special type of home produced cheese (“kupeh” cheese). There are some reports about botulism poisoning. During 2004-2012 the Centers for Disease Control and Prevention (CDC) reported five outbreaks (totally 25 patients) of botulism poisoning associated with drinking prison-made illicit alcohol (7). In another report, CDC reported two patients with botulism poisoning associated with home-fermented tofu in two Chinese immigrants (8). Browning et al. reported on three children with botulism poisoning associated with korma sauce, a mild curry sauce with a blend of cream, coconut and almonds (9). During 2011, Pingeon et al. reported two family outbreaks of botulism (a total of nine cases) associated with a ground green olive paste (10). Jalava et al. reported two cases of botulism associated with conserved olives stuffed with almonds (11). J Cowden reviewed seven outbreaks of botulism and most of them had resulted from home-preserved foods (12). Date et al. reported three outbreaks caused by unsafe home canning of vegetables (13). Thus, Botulism poisoning can develop with any home-canned food and people must avoid consumption of these unsafe products to avoid the critical side effects. All authors acknowledge the emergency and neurology department staff of Imam Khomeini Hospital of Urmia. Implication for health policy/practice/research/medical education: Educating people about home-canned foods can prevent lethal outcomes. Since botulism diagnosis is a challenging problem, primary prevention of using home-canned foods can be valuable and cost-effective. Authors’ Contributions: Gholamreza Faridaalaee, Hamidreza Mehryar, Parasto Hosseini were the physicians of the Emergency Department, who visited these patients for first time, and decided to report them; Seyed Jabbar Tabatabaee, Seyed Hesam Rahmani and Sajjad Ahmadi followed the patients management and collected the data; Gholamreza Faridaalaee prepared and wrote the report and Neda Mohammadi revised the final version. Financial Disclosure: There was no financial interest. Funding/Support: There was no support.